Home » Altcoins » What is NEM (XEM)? 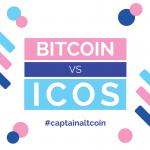 A Bitcoin Talk forum user called UtopianFuture observed the cryptomarket and noticed a specific need: a need for a community-created cryptocurrency, made by the community, for the community. Starting on January 19, 2014, he released an open call for participation on the Bitcointalk forums. His initial plan was to create a fork of NXT coin, but this was eventually scrapped in favor of a completely new codebase. As a result, we got the New Economy Movement (NEM), the Java-based platform that was launched in 2015. NEM (nowadays known as XEM) is described by its creators as “a movement that aims to empower individuals by creating a new economy based on the principles of decentralization, financial freedom, and equality of opportunity” With a C++ version in the works, XEM has a stated goal of a wide distribution model and has introduced new features to blockchain technology such as its proof-of-importance (POI) algorithm, delegated harvesting, multisig accounts, encrypted messaging, and an Eigentrust++ reputation system. Back in 2015 XEM introduced a new consensus mechanism called Proof of Importance (PoI), designed to reward users’ contribution to the XEM community. It is roughly based on proof-of-stake, but it also reflects how active a user is in transacting with other users. It’s a novel algorithm that uses network theory to assign a rating of each account’s importance in the network. POI only counts coins that have been in the account for a number of days. 10% of the current unvested amount will become vested each day. The higher the number of vested coins, the higher the account’s POI score will be. It takes a minimum of 10,000 vested coins to start harvesting (a concept similar to Bitcoin mining which will be mentioned later). POI rewards users who make transactions with other people on the network. Algorithms have been set in place to make sure users and colluding nodes can’t gain advantage by trading back and forth between a few accounts. The algorithm only counts net transfers over time. Each transaction (above a minimum size) contributes to your POI score and increases the chances of harvesting a block and collecting its rewards. Larger and more frequent transactions have a greater impact on the POI score. This provides an incentive to use XEM as a currency and offsets XEM’s already low transaction fees. For more of the technical side of PoI and XEM itself, check out this link. One risk is related to the hoarders who collect coins and simply reap the rewards from block creation. The importance score means that hoarding will result in a lower score, while spreading XEM around will increase it. Being a merchant pays better than being a cheapskate. The second risk is the nothing-at-stake problem: because block creation costs no resources, whenever there is a fork, someone can freely create blocks on both forks. This will greatly (perhaps indefinitely) prolong the fork. XEM guards against this. XEM is the first blockchain to implement delegated harvesting, an efficient way to pool account power without exposing any private keys. This process works by connecting your XEM account to an existing supernode and using that account’s computing power to complete blocks on your behalf. Each XEM node has a Proof of Importance (POI) score that determines its chances of harvesting a block. With delegated harvesting, you are lending your POI score to that supernode, increasing its chances of harvesting a block on your behalf. A separate account is created for delegated harvesting that connects to your main account. The private key of your main account is not exposed as the key of the proxy/created account is used to harvest. A one-time fee of .15 XEM is required to start harvesting. Harvesting block difficulty is kept within certain limits and fluctuates with a cap of 5%. Your computer doesn’t have to be running to harvest. Harvesting is available to any user who has 10,000 or more XEM in their account (subject to change depending on adoption, price, and community needs). Your account’s private key is never exposed while harvesting, so there’s no risk. Harvesting is performed automatically through your wallet. By harvesting your block, you can collect transaction fees for both multi signature accounts and messaging. When you harvest a block you keep all the fees from it. Check out NEM’s official tutorial for delegated harvesting if you wish to become a harvester yourself. What is NXT coin? Here is a guide about SIA coin. Every NEM account has two balances: one that stores vested and one that stores unvested XEM. XEM gradually becomes vested over time: every 1440 blocks (approximately 24 hours), 10% of one’s unvested balance will become vested. Whenever someone sends XEM, it is taken from both the vested and unvested balance, and whenever someone receives XEM, it arrives unvested. This discourages rapid trading of XEM and rewards users who hold it, while the importance algorithm discourages hoarding. Nodes create the NEM network and perform basic activities like synchronizing time to keep time stamps for transactions and blocks consistent. There are two types of NIS (Nem Infrastructure Server) nodes: super nodes and nodes. Each one is associated with a primary account with a private key which is used for authenticating responses by that node. This prevents attackers impersonating a node without a private key. Having an account with a private key is how you can run a node. Nodes are light clients, like nano wallet and are the second tier of network. It allows more users to use PoI (With 10k vested). Harvesters collect transaction fees from blocks they harvest. Harvesters keep 100% of harvested amount.These can also be run on something like a Raspberry PI to harvest although this is no longer needed since delegated harvesting was implemented. NEM implements an Eigentrust++ node reputation system which guards the network against malicious node attacks. As a supplement to this system NEM uses elliptic curve cryptography to ensure confidentiality, authenticity and non-reputability of all transactions. It uses the Twisted Edwards curve, which is considered one of the safest and fastest digital signature algorithms. The algorithm provides each peer in the network a unique global trust value based on it’s history of uploads and behaviors. This way the algorithm helps reduce the number of inauthentic files in a P2P network. Each node constantly updates the trust value of other nodes, based on their ability to successfully synchronize with and provide accurate feedback about other nodes on the network. NEM ensures the health of the blockchain by using this algorithm to monitor the past behavior of nodes within the network. In proof-of-work systems, the amount of work a node does is used as a measure for its ability to protect the network. But, with Eigentrust++, it is the quality of work that is important. This adds to the NEM network’s ability to be run and maintained efficiently. NEM includes multisig transactions as a native part of the platform. Multisignature accounts require that another user or users sign a transaction before it can be broadcast onto the blockchain. Specifically, NEM implements m of n multisignature, where m ≤ n. In this system, a pre-existing and funded address is converted into a multi-signature account and the cosignatories are assigned to it. The cosignatories can be assigned in any m-of-n combination where both the m and n can be any number of 1-32 (up to 32 cosignatories on an account); this includes 1-of-1 multi-signature contracts. Depending on these parameters, m out of n signatures need to be signed before a transaction can be added onto the blockchain. This means that if a person’s wallet gets lost as a result of a hack, no money can be spent until another wallet (or wallets if m is more than 2) signs off on the transaction. Multisignature accounts also help protect community-held funds; meaning that a majority of designated cosignatories must agree before a transaction can be made from a community-held wallet (over a third of available XEM is held in these communal accounts). While apps for other blockchains do support multisig transactions, the feature is often specific to an app, service, or wallet. NEM offers this feature as the blockchain standard, making all NEM based services able to support multisig transactions by default. There is a subtle yet critical utility about NEM’s multi-signature solution. Namely, the dedicated blockchain notarization account can be transferred from person to person. This so called “certification account” represents the state of the underlying content that is linked and broadcast onto the blockchain. These certification accounts are called “Apostille accounts” and can be moved, changed, and updated on both the private and public blockchains with multisig account support. Check out the official Apostille whitepaper for more details. Namespaces and Mosaics are a very important backbone of the NEM platform. Coupled with NEM’s multisig, mosaics and namespaces allow new levels of blockchain utility and versatility. One of NEM’s forks gave us these so called smart assets (meaning that they can be connected to any type of value or asset), which could be compared to domains and files of the Internet. Just like an internet domain, namespaces are unique and only one can have a certain name. It is possible to create sub-namespaces, up to two levels beyond the original namespace (meaning there can be three total levels to a single namespace). Mosaics are comparable to files that are being stored on a domain, meaning that they can share names with mosaics that exist on different namespaces. The final address will contain the namespace + mosaic name, meaning that there is no danger of a duplicate address being created. To create a namespace you need: 100 XEM for the root namespace and 10 XEM for every sub-namespace. To create a mosaic you need 10 XEM. Namespaces and Mosaics are a unique NEM feature which allows users to name their assets and creates the basics for the NEM Smart Asset System. Some of the main properties that the initial release of the mosaic offered were divisibility, information, domain name or namespace (required), name of the mosaic (required), mutable quantity, transferability, levy etc. In the future Mosaics might have their feature set expanded to include dividends, reputation, recallability, composability (ability to put assets in assets), issuer covered fees on trades, expansion of the non-transferable white list, levies to be redefinable, variable expirations, smart contracts, storage, and processing power. Check out this guide if you wish to learn about setting up your own mosaics and namespaces. This system is an open, customizable blockchain solution built for a wide variety of use cases on top of simple, powerful API calls. The blockchain is secured and transactions are processed by a global network of nodes running the NEM core software, and the network is used as an API Gateway server. The NEM Smart Asset System allows you to customize how you use the NEM blockchain. Your Namespace allows you to define your home on the blockchain which will contain your own Mosaics and give unique identification to user addresses, and more. Mosaics are the basic building blocks of Smart Assets that you can use to represent lots of simple things: it could be a coin, a signature, a status update or more – basically any kind of valuable asset. NEM’s modular Smart Asset system enables businesses to build a variety of real world useable applications. 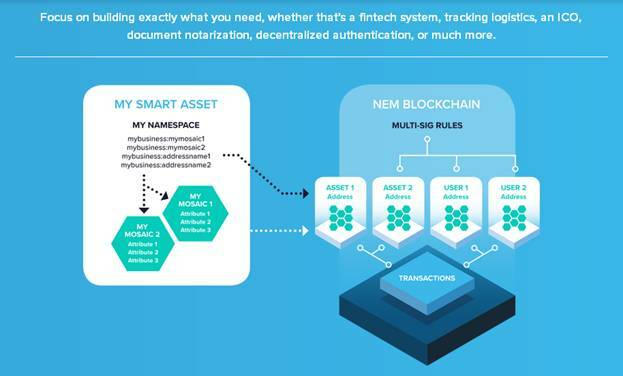 By using NEM’s built-in features to define their Smart Assets and connect them together, a company (or anyone else for that matter) can base almost any system of business transactions on the blockchain with minimal development. NEM solutions can take one of two forms: NEM provides both a decentralized, open and self-sustaining public blockchain that can be used by anyone – as well as a permissioned private blockchain solution that can be provisioned specifically for your use on your own servers when speed and privacy are the priority. Both use the same underlying code and are 100% API compatible, providing additional flexibility and future-proofing. Anyone can provision a version of core NEM blockchain that’s for use on a network of private, “trusted” nodes. In this configuration, elements of the design that prevent bad actors on the public network can be eliminated, allowing speeds to rise into thousands of transactions per second. Nodes are extremely light-weight and do not need specialized hardware or database back-ends. A simple network can be built for redundancy sufficient to prevent a problematic node from creating bad transactions or ruining network throughput. The network can then be accessed by any client or server software desired through NEM’s API interface. On the other hand, NEM has created an extremely robust, decentralized and self-sustaining public blockchain that can be used by anyone for a variety of applications. To develop on the public blockchain, simply make use of the API interface on any of its nodes. In order to use the public blockchain network, users must pay for transactions with small fees paid in XEM. The size of these fees scale with the size and complexity of transactions and are passed to providers of network capacity through fee “harvesting” on nodes. This means that increasing demand for scale and diversity of the network is intrinsically incentivized and keeps the NEM public blockchain quick and robust. The NEM blockchain’s range of features is made available through simple RESTful JSON calls to an API Gateway Server which simplifies creation of client apps, or interfacing servers to the blockchain. This makes it possible to build your apps and technology on top of the NEM blockchain while using any language you prefer, without being forced to reimplement existing business logic or develop in an unfamiliar environment of a built-in programming language. At launch in early 2015, the team of NEM consisted of over 15 developers and almost 30 marketers or translators. In late 2015, core NEM developers began working with Tech Bureau on Mijin, a private blockchain project based on the NEM open-source code. Mijin is a blockchain based solution which can be used by companies that want to improve their existing business practices. Transactions across private Mijin chains require the use of the public blockchain and XEM. Any customers paying for products or services from companies that are using Mijin pay with XEM from the public chain and the transaction is recorded on both public and private (Mijin) blockchains. In 2016, several Japanese banks ran successful experiments on Mijin, which achieved 1,500 transactions per second with 2.5 million virtual bank accounts. In 2016, NEM announced they would be launching a hybrid for-/non-profit entity to help promote NEM and blockchains broadly. They also announced they received an undisclosed amount of VC funding. All in all, the list of sponsorships, partnerships and investors in the NEM technology is ever-expanding. However, not everything has come up roses in the past for the platform and its coin. At the end of January 2018, a Japanese exchange Coincheck announced that, due to a hack, about 400 million dollars worth of NEM has been stolen from their accounts. This hack, in volume larger than the infamous Mt.Gox one, resulted in Coincheck temporarily suspending transactions and later on having a number of lawsuits head its way. Because the security breach was caused by the lack of strong security measures of Coincheck, the NEM development team refused to conduct a hard fork. Instead NEM is creating an automated tagging system which will follow the money and tag any account that receives tainted money. NEM and its XEM coin are still very much in the early phases of the platform. While NEM has been adopted by Mijin, XEM is only currently being used to pay other members of NEM and to pay transaction fees on the NEM platform. Combine this with its massive fixed supply of 8999999999 tokens and the individual coins price isn’t that high. The value of XEM will increase as the NEM ecosystem grows and we start seeing the NEM based applications and solutions slowly find their way into everyday life. nembid , similar to eBay that accepts XEM as a payment. NEM is currently written in Java and its developers have already set plans in motion to switch to a new C++ based Catapult platform which is scheduled to come out sometime in 2018. The founders have also said that one of NEM’s goals is to address wealth inequality, a feature of both existing cryptocurrencies and the “old economy.” NEM creators noticed that the equity market is very inefficient in its current form, suffering from major delays which result in people losing money. That’s why one of their missions is to implement the NEM technology as the core piece of a future revamped, slimmed down process of making transactions which would remove brokers and custodial services from the equation. This way they hope to end up with a much more efficient system which would save the world economy billions of dollars. You can read more on how they plan on bringing this “New Economy Movement” into fruition here. NEM does not market itself as a cryptocurrency but rather as a blockchain project which caters to much more than only handling it’s native currency tokens “XEM”. Above that, and more importantly, NEM does represent a peer to peer platform which provides services like payments, messaging, asset making, and naming system. Built from scratch to avoid the same pitfalls as other bitcoin forks that become nothing more than “just another altcoin”, NEM’s future looks promising. People should expect more to come as NEM keeps evolving its blockchain based solutions and technologies.